Kookkai Printing operates several full-service copy centers, providing low-cost services to meet client needs for reports, course materials, flyers, and presentations. Professional binding options, stapling, folding, cutting, reduction/enlargement and a wide variety of paper stocks are available. Staff will consult on any project and provide free pickup and delivery. Hours may vary by site. Kookkai Printing helps keep things simple for you by providing one-stop access to a variety of document-related services. Contact us for service availability, pricing and/or scheduling. 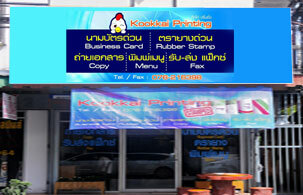 Kookkai Printing has professional solutions for both your business and your personal printing needs. Bring your ideas and let us help you perfect your image. There’s no copy job too large for us. Let us make the copies while you take care of business. We stock a variety of papers and can "finish" your documents to your specifications. Whether you're working on a business proposal or creating a new restaurant menu, we can help you choose the best look to complete your project.